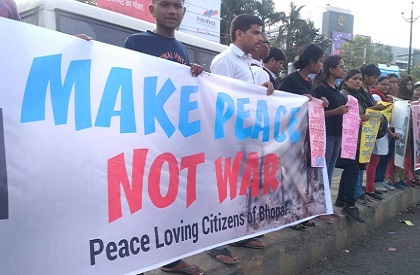 BHOPAL: Citizens took to streets in the city on Sunday, taking a stand against war. 'We want peace, not war', most of the placards read. People from different sections of the society including writers, activists, youngsters and members of social organisations, made this appeal at Board Office square. 'The consequences of war are devastating for nations. We want peace', read one of the placards in Hindi. The youngsters who were part of the demonstration, also said that social media must not be used for war-mongering.